This book has both positive and negative aspects. On the positive side it shows extensive research examining the takeover of the United States Embassy in Tehran. That research, however, is incomplete. It also does not show original thought and analysis in understanding the root causes of what transpired. Carter miscalculated Iran by failing to understand that Iran’s motivation in countering Israel and hence its supporter, the American “Big Satan,” is religious. The Farsi mullahs are motivated by religious principles. That aspect of Iranian policy is not discussed at length in this book. What is also missing is a better analysis of why the hostages were finally released. Blum did a good job in selecting sources to be interviewed. Some have very good insight into what happened before and during the hostage crisis. That insight was used to carry the burden for Blum’s limited grasp of events. Her contribution seemed to be a pointed effort to link Carter’s poor foreign policy with that of Obama in a crusade to prevent Obama’s re-election. As an employee of CIA at the time of the hostage taking, I can say very clearly that Blum prefers trite statements rather than in-depth understanding. Stansfield Turner was not nominated as CIA director to further Carter’s “nice guy” approach by firing human intelligence case officers. It was an era of increased scientific collection capabilities and adjustment to new technologies. Turner was trying to lead “The Agency” in a period of transition. The intelligence failure of Iran caused a re-think. (Responsibility for that failure was also shared by the Departments of Defense and State, both at the collection and analytical levels.) It is easy to blame Carter, since as President he held ultimate responsibility. 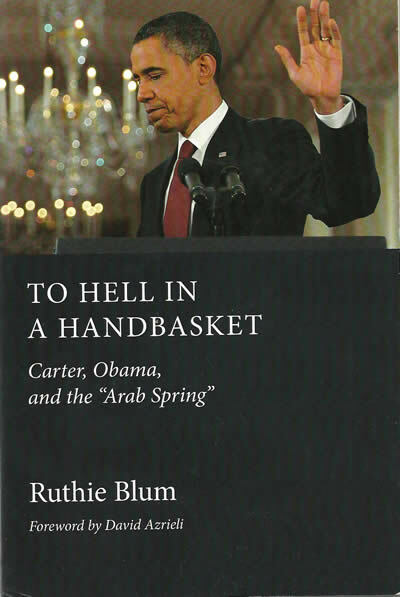 As Harry Truman’s desk sign reads, “The Buck Stops Here” with the President, but the reader of a book expects more. Blum is correct that Obama is no more enlightened than Carter in dealing with foreign policy. His statements continue the philosophy of being a “nice guy” to win friends. To cite a 1948 quotation usually attributed to baseball manager Leo Durocher, “Nice guys finish last.” Blum is right in asserting that a superpower advances its interests by flexing its muscles and gaining respect, and not by looking to please everyone. Many of Obama’s statements have had the opposite effect, emboldening groups with anti-American values (such as the Muslim Brotherhood), as they surmise that they have succeeded in pulling the wool over American eyes. A problem with this book is that the section on Obama is almost an after-thought or tack-on, appended to influence American voters. A professor from Haifa is quoted with excellent analyses of Arab Spring (not the democratic advance that Obama was supporting). His well-chosen words, however, overshadowed any personal contribution from the author. Rather than evaluation and analysis, she presents lists of dates and events, leaving the reader to search for better meaning. Let us be kind. Blum at least deserves credit for quoting excellent sources. One criticism of this book is obvious. It reads as election propaganda, essentially warning the reader about the dangers of re-electing Barak Obama. The approach of the author would have been much better had she tried to be more objective and less partisan. Now that Barak Obama has been re-elected to a second term, the issue of voting for him is moot. The thrust of his policies is now the issue on the table. Blum’s writing is surprising given the fact that she is a professional journalist. She has a propensity towards loaded vocabulary such as “thugs.” Objectivity is never achieved by calling people names. She should also be taught that “enthused” is not a word in proper English; the accepted form is enthusiastic.